It seems as though wedding trends are constantly being superseded by even newer, more outlandish ones, reflecting the continual evolution of the modern wedding. Ministers in general—and not just in their capacity as wedding officiant—have had to adapt to the rapid innovations in technology which have come to define our everyday lives. As we discussed in a recent article, the vicar of one Anglican church in London is now performing the consecration of laptops on Plow Sundays. However, the blessing of laptop computers and mobile telephones was insufficient For newlyweds Ting and Josh Li, who decided to forgo the traditional church setting and surround themselves with the latest gadgets on this most special of occasions by holding their ceremony in one of the grandest palaces of technological innovation—the Apple store on New York’s famed shopping thoroughfare Fifth Avenue. Nor was the occasion a private one attended only by friends and family; rather, the congregation consisted of a random assortment of individuals. 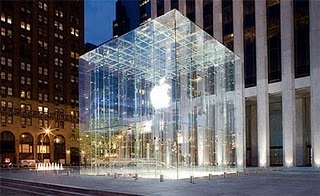 Like many shops in New York, the Fifth Avenue Apple store stays open till the wee hours of the night in order to accommodate the enormous city’s diverse population, and amid Ting and Josh’s friends and family lingered hapless late-night shoppers checking out the latest gadgets. The spectacle inside was, apparently, an odd mixture of timeless tradition and modern savoir-faire, a truly post-modern defiance of expectations. Even the young couple’s pet was invited to watch the wedding officiation. As Stephen Hutcheon of Victoria, Australia’s The Age reports, “[o]n the stroke of midnight on Valentine’s Day, the couple, wearing full wedding regalia, their pet shiba inu, Shio, and 20 guests walked down the glass spiral staircase” at the store. Rather fortuitously, it was the couple’s mutual interest in Apple computers and telephones which led to their acquaintance inside the store, where their relationship grew and flourished into a full-fledged romance, so it was perhaps only appropriate that they should make the birthplace of their love the place to solemnize it too. Like a growing number of couples, the Lis have eschewed the exclusively traditional wedding ceremony and opted for an inspiring and contemporary twist. Their wedding is just another example of their identity as a couple—in this case, a reflection of their place in modern technological culture. Environmentalism is an important consideration for other contemporary couples, who seek to make theirs an eco-friendly, green wedding as a statement of their own values. However one defines marriage, it is evident that this institution is changing at a rapid pace to echo the personal preferences, passions, and values of a new generation.